Dutch painter. He worked in Amsterdam as a painter of seascapes and winter landscapes from c. 1641 until his death. He also did chalk and ink drawings of the same subjects. His earliest paintings were seascapes executed in the style of Jan Porcellis and using the restricted palette associated with the tonal phase of Dutch painting. From c. 1650 to 1653 Dubbels was employed in the studio of Simon de Vlieger, where he developed close artistic contacts with Jan van de Capelle and Willem van de Velde II, and de Vlieger s influence can be seen in the scenes of Amsterdam and its environs that Dubbels painted independently until c. 1658-60. He worked mainly for other Amsterdam marine painters: he was in the studio of Willem van de Velde I until 1672-3, when van de Velde and his son emigrated to England. After that Dubbels worked with his former pupil, Ludolf Backhuysen. 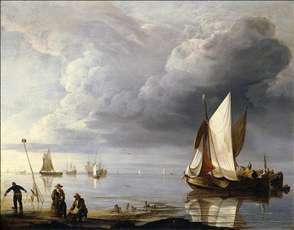 See more details about "Small Dutch Vessels in a Calm"